Minahan takes readers step-by-step through the process of understanding and practicing the components of a FAIR behavior intervention plan so that they or a team can immediately customize it and put it to work in classrooms. Additional tips on creating interventions, as well as checklists to help with implementation and monitoring progress, are also included. Jessica Minahan translates complex knowledge about challenging behavior so that teachers and administrators have tools and strategies they can immediately implement. The Behavior Code Companion is a game changer that will help all schools who think they have run out of ideas. The Behavior Code Companion provides hope for teachers who are feeling hopeless. Minahan provides so many creative and reasonable ways to overcome seemingly insurmountable obstacles that she makes me want to go back to public school teaching! What a much better place schools would be if all school personnel and mental health professionals used this book! 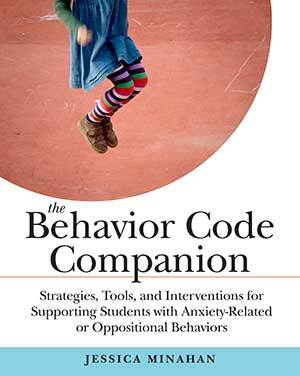 The Behavior Code Companion offers brilliant insight into mental health issues in the form of practical, research-based interventions teachers can actually implement. The Behavior Code Companion is an invaluable resource for parents, teachers, administrators, and related service providers, filled with tools that allow for effective and positive modification of challenging and interfering behaviors while preserving the child’s dignity. Jessica’s strategies will surely support child success in and outside of the classroom. The Behavior Code is filled with clear and effective intervention strategies designed to identify target behaviors and build skills needed for success. As an outgrowth of the need for continued professional development for RtI teams, the author wrote The Behavior Code Companion. This book was written to assists educators with real life situations that allows teams to practice isolating specific behaviors and discuss modifications to the student’s environment paired with instructional variables. Multidisciplinary teams throughout our district have found this approach as an essential resource when continuing their own growth in customizing an individual students FAIR plan. Teachers throughout our school system have found The Behavior Code strategies and interventions to be highly effective in supporting students with mental health issues. The Behavior Code Companion adds tremendously to any educator’s tool box as it provides real, concrete and doable strategies and interventions, including activities, exercises and tools. This book offers essential, easy to implement, professional development for every teacher struggling with inappropriate student behavior.